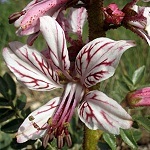 This beautiful plant of the Rutacean family has its natural distribution from the Mediterranean area to northern China but it is also found in Central Europe on warm grassy slopes and in open deciduous forests where the ground is basic from limestone or volcanic rocks. It has been grown in gardens for centuries but seems to be less well known today. D. albus is a stout 60-100 cm perennial with rosy, somewhat asymmetric dark-veined flowers in upright clusters. 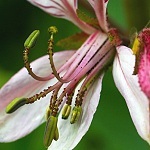 The flowering stalks, seed capsules and even the stamens (see photo!) 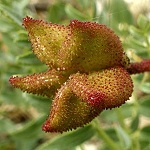 are covered with red, glandular hairs which on touching give off a strong smell of lemony-anisic character. Be careful however, the essential oil contains bergaptene and is phototoxic ! As the seed capsule ripens it forms five sections that ultimately, after drying out, send the shiny black seeds several meters away in almost explosive ejections. The smell from the essential oil is mainly due to methyl chavicol (esdragol), anethol and a number of monoterpenes including limonene and gamma-terpinene . However, more than 60 % of the oil consists of one compound: 1-allyl-4-(3-methyl-2-butenyloxy)-benzene (dictagymnin). This chemical decomposes easily to chavicol and the very flammable hydrocarbon 2-methyl-1,3-butadiene (isoprene, b.p. 34 C). The emanation of isoprene, which can be especially intense on hot windless days, leads to an isoprene cloud that may inflame without any harm to the source plants. 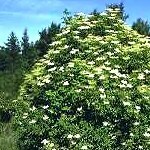 Over the years numerous attempts have been undertaken to provide a rational explanation to the phenomenon of the biblical "burning bush" and to establish the identity of the plant species which may "burn and not be consumed" (Exodus 3:2-4). Among these, the 'gas-plant' is probably the most relevant candidate . 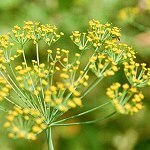 Dill is a thin, annual umbellifer originating in the Middle East. 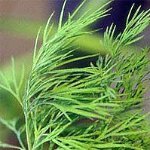 Since antiquity it has been cultivated as a medicinal and aromatic herb. It was brought to the rest of Europe through the monasteries. The picture on the left shows a broad-leaved variety, the original type has completely thready leaflets. Etymology: Lat. graveolens, strongly odorous, from Lat. gravis, heavy, and Lat. oleo, smelling. The genus Durio contains some ten species, originating in tropical South East Asia. They are beautiful trees in bloom, but the flowers, smelling like curdled milk, are lost already the first night. They are pollinated by bats. Durian uses the 'announcement by smell' at its ultimate. The ripe fruits are perceivable at more than a kilometre's distance. Several animals risk their lives to get hold of them. Squirrels, hornbills and orang-utans seek them out when the fruits are still hanging on the trees, while deers, sun bears and even tigers take them at the ground. Local inhabitants are not less enthusiastic, but the smell of (less than absolutely fresh) durian is repulsive to most Europeans. In some Asian airports durian is forbidden! repulsive and strangely attractive at the same time. The soft, yellowish, creamy flesh around the large seeds, however, has quite another flavour, still sulfury, but with buttery, fruity and even brandy-like nuances - depending on variety and ripeness . The emitted substances may be divided into sulphur-compounds like linear and cyclic sulphides, mercaptans and thio-esters, and the more typical fruity odorants including a great number of aliphatic esters and alpha-hydroxyketones (acetoins). 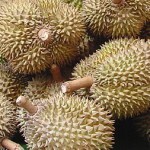 In a study by Näf and Velluz it was found that the fruity aspect of the durian flavour is influenced by ethyl deca-2,4-dienoates, -3,6-dienoates and -2,4,7-trienoates . Weenen et al. 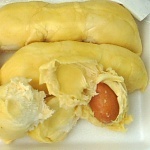 identified one of the strongest smelling sulfur compounds in durian to be 3,5-dimethyl-1,2,4-trithiolane. They also found that ethyl 2-methylbutanoate had the strongest odour impact among the non-sulfurous odorants . Etymology: Lat. zibethinus, from Lat. zibetha, the name of the strongly smelling civet cat. Hotrienol: "It has a fine lindenblossom note with aspects of violet leaf and hints of melon." Isoleucin methyl ester: "Very powerful and highly pitched odour, curiously displaying a multitude of fragrance notes. The amine-like character is supplemented by orris-like, nut-like, licorice-like and tobacco-like notes with a hint of natural musk undertone" . 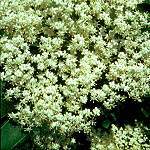 Etymology: hotrienol was first identified in the essential oil from the Japanese Ho tree, Cinnamomum camphora var. orientalis subvar. linaloola.